Well, I say no soil, but that’s not entirely true: there was about six inches of clay above the shale that represents our bedrock. About a month after we moved in, our elderly dog died. We tried digging a hole in the back garden; it was December, it was raining and we managed to get down about a foot… we gave up. At this stage we were beginning to wonder what we could do – it was Christmas and the vets was closed, so cremation was not an option. Should we put the dead dog in the freezer for later disposal? Should we go and bury her ‘in the wild’? Should we build a mausoleum? After some debate we decided the try planting her in the front garden. So, shovel out, body discreetly just inside the house and we tried again. This time was more promising, there was a slightly greater depth of soil and then we hit concrete… some part of the sewage system we later learned. Then, inspiration. There was a healthy-looking hydrangea in a corner – perhaps its roots would have broken up the ground. And, indeed, success. The hydrangea was removed, the hole was expanded into a grave (fortunately the dog was quite a small terrier) and we could proceed. At which point one of our new neighbours came over to say hello. “Doing some gardening?” she enquired. “Yes,” we responded cheerily, heartily thankful that the body was still indoors and that we weren’t going to have to make small talk about deceased pets. The neighbour eventually disappeared back home (we were grateful for the rain at this stage) and the burial commenced, with her nose towards the rising sun and her favourite cuddly duck and a stone (she was inordinately fond of those) as grave goods. Hydrangeas are not my favourite shrubs, so we planted a lilac over our canine friend (I had one waiting to go in the garden somewhere) and planted the hydrangea in the hole with the concrete in the bottom. I’m pleased to report that both plants are doing well. So, as you can tell, we are a bit short of soil here. We shouldn’t be. The field behind our house isn’t – but there’s a step of about 12 inches up to it. In this area, when they build houses, they strip the topsoil (and more) from the plot and sell it. This leads both to drainage problems and to a nightmare in terms of subsequent gardening. We have pretty poor soils round here to begin with, so losing the majority of what there was to start with just compounds the problem. Because gardening to produce food was a particular intention, we had to take steps. We started by installing log rolls to create some beds in the lawn and mulching with black polythene to kill the grass. Once done, we added homemade compost and hoped this would allow us to be productive. Sadly the waterlogged ground in the winter caused the wood to rot and anyway the beds simply weren’t deep enough. So, we dismantled those after a couple of years, bought some old railway sleepers and created new beds – bigger and deeper. Unfortunately we couldn’t generate enough compost to fill them, so, with heavy hearts, we bought in some topsoil, hoping that it hadn’t come from some other building plot now bereft of a growing medium. 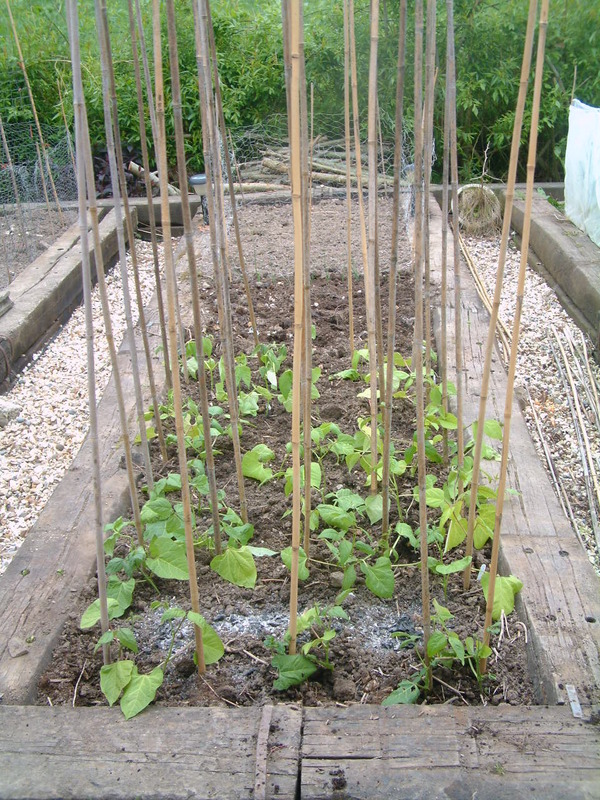 And finally we had a sustainable system – raised beds don’t get waterlogged, we keep them fertile with compost produced on site (including willow shreddings and chicken poo) and we eat fresh food from them throughout the year. I just can’t help feeling that much less energy would have been expended and the system would have been naturally sustainable if the builders had left the soil where it was in the first place! Grumble. Dear Dr S-o-H, I have a composting question, I have lovely compost, but ’tis SO full of egg shells, any ideas of how to make them break down more fasterer? really only because I don’t like looking at them, or should I embrace their potential anti-sluggery properties? Learn to love them! I suppose the best thing to do is break them up when you put them in the compost in the first place – greater surface area will mean they break down quicker. Of course if you kept chickens you could bake the egg shells and feed them back to the hens as a source of calcium (perhaps the ultimate in recycling)… and the chickens would eat the slugs too. Get some chickens – you can train that dog of yours to leave them alone!